So even though this is a bit of a re-post, I've learned a few things in the past two years and now I've got a video to show the whole process to you, so let's get started! When I say I "freeze my own fruit" I mean that I buy my fruit fresh, wash it, chop it, and freeze it so that it's all ready for smoothies for the week. Saving money- I buy a lot of frozen fruit and some of it can get expensive! Frozen strawberries can run up to $5 a bag, but when I freeze it myself, sometimes (especially in the summer) I can find 16 oz. cartons of strawberries for around $3. Thanks to my favorite health food store here in the Kansas City area, Nature's Pantry for these lovely savings and for being being a great resource for organic produce. Sometimes that stuff is hard to find! Anyways, when you multiply the fresh strawberry price by 5 (the number of bags I get each week) it only costs me $15, a nice savings compared to when I buy them frozen, which costs me $25. $10 savings...talk about saving some green! The best fruit savings I've found comes from pineapple. One 16 oz. bag of frozen pineapple costs $2.89 (at Wal-Mart), and a fresh pineapple costs about $2.80. Seems similar right, wrong. When chopping your own pineapple, I can get 2-16 oz. bags worth of pineapple to freeze. Hooray for that! Time- yes, it will take you a bit more time to wash, chop, and freeze your own frozen fruit. But if you're up for the challenge, and have a few minutes to spare, it can help you save some money. Possible decrease in nutritional value- since most frozen fruit manufactures say that they freeze fruit quickly after it's picked, the fruit that I freeze has traveled from where it's grown, to get packaged, to the store, and then to me...possibly decreasing the nutritional value of it. But since most of the produce we eat is in the same form, it's not much of a difference. If you're wondering why I make organic produce a priority it's because of two lists put out by the Environmental Working Group, called "The Dirty Dozen" and "The Clean Fifteen". These are basically lists of the dirtiest fruits and vegetables (highest in pesticide residue), and the cleanest (lowest in pesticide residue). So when choosing what produce to buy organic, I make sure and get anything listed on the "Dirty Dozen" list and when deciding what to buy conventionally grown, I consult the "Clean Fifteen" list. Want a numerical countdown of all the fruits and vegetables and their ranking (#1 being the highest in pesticide residue, or #49 being the lowest in pesticide residue)? Click here. As for my own fruit, strawberries are #5 (always buy organic), pineapples are #47 (pretty much always conventional), and bananas are #27 (usually organic, but not the end of the world if they are conventional). Strawberries are my top fruit to freeze. savings by freezing it yourself. say, we make a lot of smoothies! 2. Find something to put the fruit onto when in the freezer. I use glass casserole dishes or Pyrex containers. I am very careful not to put plastic into the freezer, so glass is my go-to. In case you're wondering, I don't cover them and the fruit seems to freeze just fine. 3. Wash your produce. I use my "Homemade Fruit and Veggie Wash Cleaner". 4. 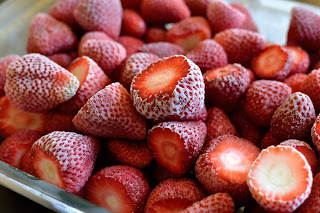 Chop of the stems or any extra part of the fruit you don't need and then place them in the casserole dish. Don't worry if they touch or overlap, they will freeze fine. own "Banana Bank" as we call it. 5. Now place in the freezer. Don't be afraid to stack the casserole dishes if you have to (like I did with the pineapple container which is hiding under the strawberries). It helps to put the bigger ones on top of the smaller ones this way the fruit won't get smashed. 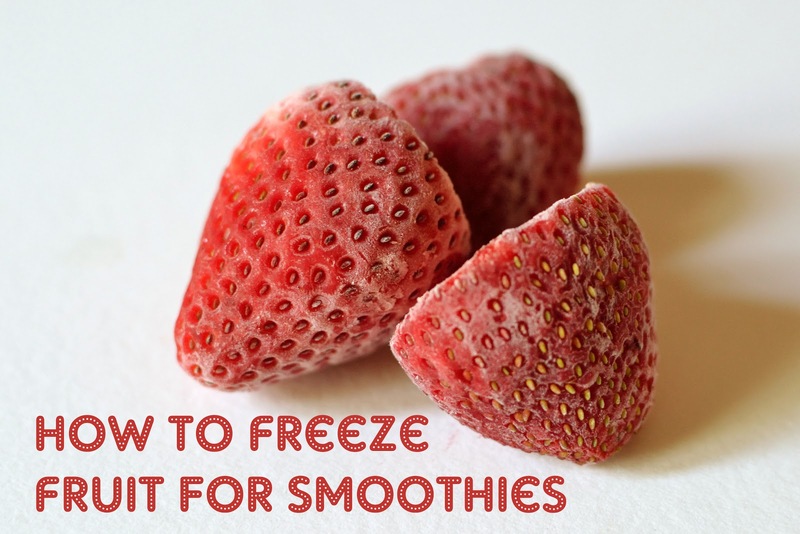 Give it a few hours, like overnight, or while you're at work and before you know it you'll have your own frozen fruit! Once the fruit has been frozen, you can leave it in the casserole dish or remove (may take some prying at times) and place them in a container for easier access. Nothing like trying to pry off some frozen strawberries from the pan when you're running late in the morning! Blueberries, just wash and freeze. Watermelon is pretty easy too, just chop and freeze! 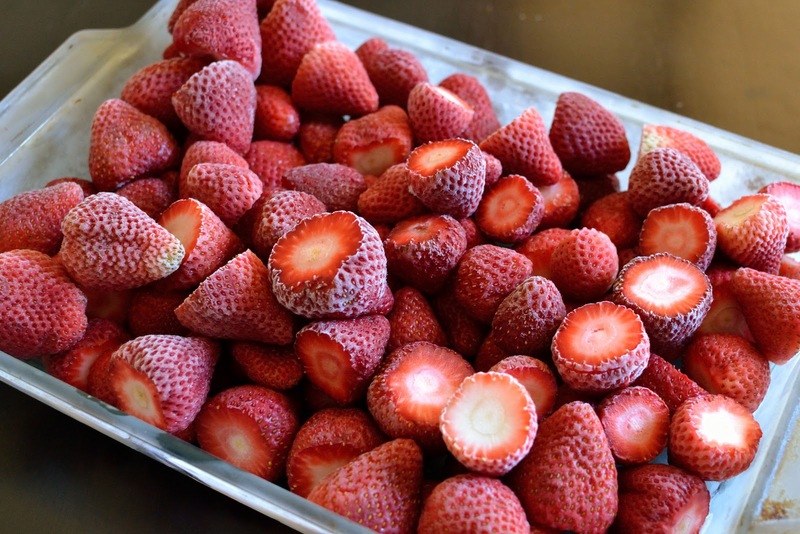 Other fruits I've frozen before, include grapes, oranges (be sure to peel and seperate), and raspberries. Have you ever frozen your own fruit before? What did you freeze? Did it help save you some money? Share your tips below! Recently this post was linked up to Frugally Sustainable as part of the "Frugal Days, Sustainable Ways Blog Hop." So check it out and find more ways you can green your plate, your body, and your home! This post was also linked up to "Your Green Resource" where a variety of bloggers get together and share their green ideas, solutions and resources. You can check out the link up party on any one of their four hosting sites: Andrea at The Greenbacks Gal, Stacy at A Delightful Home, Emily at Live Renewed, or Megan at Sorta Crunchy. 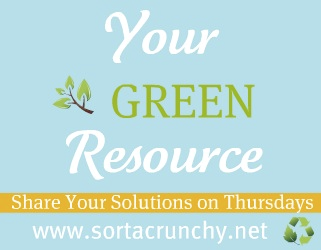 There's a plethora of amazing green ideas and tips on these blogs and links so go check it out! This post was recently linked up to "Healthy Vegan Fridays" which you can find on any of these three blogs: Everyday Vegan Girl, Veggie Nook, and Carrie On Vegan. So get your "vegan on" and check out some of these great recipes and vegan cooking tips!